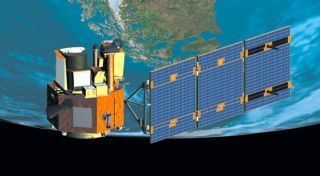 NASA's Earth Observing 1 (EO-1) satellite was part of NASA's New Millennium Program. The satellite was decommissioned in 2017, but will remain in orbit until the 2050s. For just over a decade, NASA's New Millennium Program (NMP) developed technology-focused missions to gather science about the Earth and the solar system. The program's goal was to test emerging technologies and instruments in space at a relatively low cost in order to reduce the cost and potential damage of larger, more pivotal spacecraft. The NMP flew six missions before its budget was canceled in 2009. The technology found on NASA's space and planetary missions undergo severe testing while on the ground. But hardware failure led to the loss of a handful of missions, such as Mariner 3. "It is much more difficult to design specialized equipment and components to withstand the harsh environment of space —zero pressure, extreme temperatures, and deadly high-energy particles — than to design 'gadgets' for everyday applications here on Earth," according to NASA's NMP website. Enter the New Millennium Program. Launched in 1995, the program was a joint venture between NASA's Office of Space Science and Office of Earth Science, and described by NASA as "an ambitious, exciting vision to speed up space exploration through the development and testing of leading-edge technologies." By reducing the risks and costs of future NASA space science missions, the NMP hoped to reach its goal of having multiple spacecraft exploring the solar system on different missions happening at the same time. According to a 1997 overview, the technologies tested by the program would help develop methods for producing lower-mass spacecraft and increased spacecraft autonomy, which would require less input from controllers on the ground. Advanced propulsion techniques were also planned for development, to allow spacecraft to reach their destinations faster without the need to reduce its mass. Although the primary goals of the NMP program involved field-testing the technology, science was a core requirement for each mission launched into space. To minimize losses should the technology fail, costs were kept low in relation to other missions; in the last year of the program, the 2008 budget for New Millennium was only $25.8 million out of NASA's $17.3 billion total budget. The New Millennium Program flew six successful missions. The hardware tested by the program has since been incorporated on NASA's Cassini mission and the European Space Agency's LISA Pathfinder mission. During its lifetime, NMP gathered input from both the space and Earth science communities. An Integrated Project Development Team consisting of scientists, mission planners and technologists then combined various proposals into working mission concepts, which they submitted to NASA Headquarters for approval. The main goals of NMP were to reduce the size of the launch vehicle and the number of people required for the mission's operation — the two most expensive parts of any space mission's budget. To reduce costs, NMP tested instruments that were smaller and lighter, as well as those that could serve multiple functions and thus, reduce the need for multiple instruments. The program also focused on ion propulsion, which increased the speed a spacecraft traveled to its destination, and autonomous navigation, which reduced the need for an operation team. NMP team members looked for ways to make power production and use more efficient and worked on improving communications between spacecraft and Earth. Originally, New Millennium missions that tested technology for planetary missions were named "Deep Space," while those that observed our own planet were called "Earth Observing." An overhaul to the program in 2000 led to the Deep Space group being renamed "Space Technology." Deep Space 1 (DS1): Launched in October 1998, DS1 tested a total of 10 advanced spacecraft technologies for ion propulsion, communications, autonomous operations and navigation, multifunctional structures and microelectronics, as it flew by two comets. Deep Space 2 (DS2): Launched in January 1999, DS2 carried technologies to help enable future Mars surface networks, including a single-stage, passive atmospheric entry system and a high-impact landing system designed to deliver the science payload up to 3.2 feet (1 meter) below the Red Planet's surface. DS2 was also carrying a miniaturized telecom system, low-temperature batteries and a suite of miniaturized in-situ scientific instruments. The mission was lost on Dec. 3, 1999, along with the Mars Polar Lander that it had hitched a ride on. Earth Observing 1 (EO-1): For nearly 17 years, EO-1 collected over 90,000 images of Earth. Along the way, EO-1 validated a multispectral instrument that was a significant improvement over the previous instrument carried by the Landsat 7 satellite..
Space Technology 5 (ST5): Three full-service microsatellites tested the ability of miniaturized satellite components. Each carried instruments capable of guidance, navigation and control, attitude control, propulsion and high bandwidth,complex communication functions. The microsatellites also carried their own mix of new technology, including a micropropulsion system suitable for small changes in direction, an improved communication device, a coating that limits how heat is transferred and microelectronics with increased radiation tolerance. Space Technology 6 (ST6): Rather than a spacecraft, the ST6 mission was composed of two separate subsystem technologies, or software to help make spacecraft more efficient. The Autonomous Sciencecraft Experiment was beamed aboard EO-1 in early 2004. One of the softwares enabled the spacecraft to "decide" what kind of observations would be scientifically valuable and what data or images were important enough to send to Earth, all without human input. The Inertial Stellar Compass, another software package beamed aboard TacSat-2, allowed the spacecraft to continuously determine the height or direction it points, and enabled the spacecraft to recover its orientation after a temporary power loss. Space Technology 7 (ST7): The ST7 project flew a Disturbance Reduction System, which incorporated enhanced thruster technology with enhanced sensor technology to demonstrate precision spacecraft control. The system validated the position-measurement of objects in weightlessness with about 100 times greater accuracy than ever before. The budget for the New Millennium Program was cut in 2009, ending the program. However, its legacy flies on in missions such as Deep Impact, Dawn, Mars Exploration Rovers, Mars Science Laboratory and Lisa Pathfinder. Read more about each of the New Millennium missions. An overview of the technology developed and tested during the New Millennium program. Listen to NASA's podcasts about the New Millennium program.